The objective of the Arezzo Program is to provide students with an authentic and intensive experience of Italian language and culture achieved through academic courses, immersion in community life, cultural activities, and study related travel. A five-course curriculum including archeology and architecture of ancient structures, Italian language, history, art history and literature, and cultural studies fosters learning across departmental and disciplinary boundaries and privileges a contextual and interactive approach as well as constituiting a humanities cluster. Moreover, with sufficient enrollment, new courses will be offered in Spring 2019 in the areas of public health, social media, documentary film making, and international management. Along with traditional classroom instruction, a good portion of the teaching in the Arezzo Program takes place on location: before a painting in a museum or a monument inside a church, in a Roman archeological site, in an observatory, in a medieval castle, in a Renaissance palace, or in an urban or natural setting, as the subject matter requires. 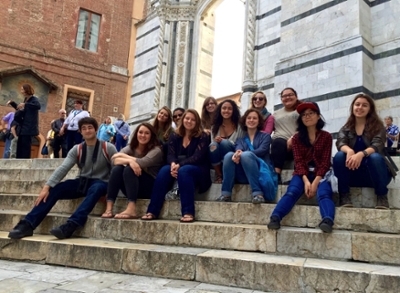 Interaction of University of Rochester students with local students as well as international students studying in Arezzo is worked into the curriculum through the Cultural Studies course. A program involving a variety of hands-on cultural activities and experiences flanks the language program. Students live in private apartments or residences in close proximity to the city center. Meals are in small local restaurants, cafès, and are self-catered. Laundry facilities are near housing. The Arezzo Program is totally integrated within the academic system of the University of Rochester. It is designed, maintained, administered, and directed by the University of Rochester and its appointed faculty and staff. The University establishes and guarantees the educational standards of the Program itself. The Program is co-directed by Donatella Stocchi-Perucchio—Associate Professor of Italian in the Department of Modern Languages and Cultures at the University of Rochester, and native of Arezzo—and Donna Logan, former Lecturer of English in the Arezzo Branch of the University of Siena, native of the United States, and long-standing resident of Arezzo. The program carries 18 credits. Of the 18 credits one earns, 8 are applicable to the program in Archeology, Technology and Historical Structures. No prior study of Italian is required—classes are taught in English. Language instruction is customized to the individual needs of the participants. Special opportunities are available at the University of Arezzo for students with advanced knowledge of Italian. First year students, sophomores, juniors, and seniors are eligible to apply. Cost of the Program is virtually equivalent to the cost of one semester spent on campus (tuition plus living expenses). Students who receive UR financial aid may apply it towards the program.